Shining Stars Boarding School, Sanepa, Lalitpur. This is one of the common expressions students in my school use. I’ve been teaching English in a secondary school in Lalitpur for almost two years, and here are few of the problems I have come across. Sir, he is beating me and taking my book. He is pushing for me. She is pushing for him, and beating for him. And he is crying. I am not so sure how the students picked up this sort of English speaking habit in the school. But I think they might have picked it from the teachers in the first place. A common logic says – students learn from the teachers. May be from the English teachers, or may be from other subject teachers. The school system says, we need to create English environment. Everyone must speak in English, both the teachers and the students (except for in the Nepali classes). This system is followed in most of the private boarding schools all over Nepal. I don’t know how far the system has been effective. But, I can’t change the system. If it was up to me, I would give the students a choice between learning other subjects in English or their mother tongue Nepali. I’m not sure if that would work either. Until that happens, the teachers need to stick with the system and try to be better at it somehow. Coming back to my situation, the second problem – the students speak a weird form of English; a version which is a direct translation of Nepali to English and mixed with incorrect/unusual sentence structures. Some call it “nepanglish”. Some say its okay, and that we should use English in our own Nepali context. It will even help develop a new dialect of English – a native-tied version of English, they say. Some, just like me, frown over it. I’m facing this crisis in Class 9 and 10, every single day. I’m stuck in this strange dilemma – whether to finish the course in time and prepare them for the SLC exam or to teach them right from the basic grammar and basic English expressions. May be the whole concept of teaching English in the schools has to be redefined. May be the system (like, English Speaking Zone) needs to be discarded. May be we’re giving pointless importance on English as a foreign language. Or may be, we should be able to use English without grammatical errors and we need to strive for it. May be, we don’t have to speak or write correct version of English at all and we will still do well in future. Lots of may be-s, lots of opinions. Meanwhile, here’s a list of some “nepanglish” expressions I’ve heard students (and teachers alike) use in the school. Fall downing. Take outing. Get upping. Well, how is it at your school? I really enjoyed reading this article. Actually, the issue of whether or not teaching all subjects in English (except Nepali) from pre-primary level, as it is happening in private schools (and community schools at present), at present is working effectively for better learning of children is a critical point you have raised. This has not become the issue for academic debate yet. We are taking this practice as a granted. Thank you for sharing children’s English language use on-the-ground! Hope to read such posts in future as well. Umesh ji, it is good to have dilemma as it will lead you towards inquiry. Hope you start your investigation into this controversial area of study. I am of the opinion ‘let it go’. Our students are, on the one hand, adding to Nepalese corpus and on the other hand reflecting their identities through distinct expressions(I will prefer to avoid the term ‘incorrect’). Thank you for initiating the discussion. I hope you come with many more dilemmas next time. Thank you for your opinion (and your replies on the email). My current motto is – finish the course on time and then give the students something extra, something worth while. I’ve banned (almost) the expressions like “headache became” in school.. some students have tried overcoming this, sadly many teachers haven’t even tried. The future looks interesting ! Oh yes, Umesh ji’s dilemma is obviously common to all those English teachers working in private English schools. 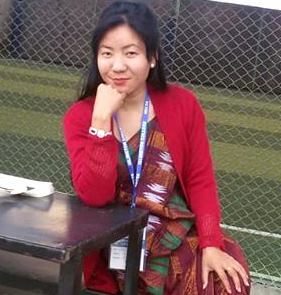 I myself started my teaching career from an English medium school located at Janakpur of Nepal. The school had also followed the practice of ENGLISH SPEAKING ZONE and the students who failed to speak English were punished as well. I was in dilemma too while teaching the students of upper kindergarten (UKG) where I was the class teacher. On one hand, the students were asked to speak in English while they, on the other hand, lacked proper knowledge, skills and competence to communicate in English. However, I was given a special task there to teach the students of UKG on how they could speak English. I faced the problem in the beginning since I could not find any textbooks that could be useful to me in teaching the students how they can easily communicate in English but later I myself decided to follow my own instruction and materials to achieve the goal of English Speaking Zone. I started from action verbs and then continued with all the parts of speech. The examples and the assignments that I used to provide them were based on situation and context they have been growing. It was very useful for me since it worked very well. My classes used to be comprising of both theoretical and practical aspects. I was successful in teaching the young learners on how they could speak and write in English to the extent they were required. However, the most exciting and funny experience I had while teaching the young children was they used English words along with Nepali ones. When they do not know the particular word in English, they used the Nepali word in English sentences. For example, one of the students made complaints when someone pushed her in this way, “Sir, Meera is dhakeling me”. Here dhakel+ ing is a Nepali word used with suffix ‘ing’. When I heard such sentences, I used to laugh out and responded them, “Don’t dhakel”. Later I used to teach the word “push” and its different forms like push, pushed, pushing and pushes accompanied by their action of pushing. Thank you Umesh ji for raising the genuine issue through the post that is really prevalent at so-called English schools. Thanks for sharing your classroom experience. The more I ponder over this issue, the more I think that we’ve been following a practice [English only] which has already been discarded many years ago by the institutions in the West. I have been thinking of incorporating Nepali in English classes for a while. And this article that I stumbled upon demonstrates how both L1 and L2 can be used for effective teaching/learning of English. I want to do something similar, not because I am incompetent in English teaching, but I just want the students to understand better.